Stanford’s men’s swimming and diving team starts its 2017-18 season this upcoming weekend when it travels to Salt Lake City for a coed conference dual meet at Utah. The Cardinal, which ranks No. 3 in the preseason College Swimming Coaches Association of America poll, looks to build off of its fifth-place finish at the NCAA Championships in 2017. Below is preview of the 2017-18 season. Stanford welcomes seven freshman from seven different states or territories – New Jersey, Texas, Minnesota, Maryland, California, Puerto Rico and Georgia — to The Farm for 2017-18. Johannes Calloni • Freestyle • 6-0 • Jersey City, N.J.
Jordan Greenberg • Freestyle • 6-1 • Eden Prairie, Minn.
Matthew Hirschberger • Freestyle • 6-3 • Northern Bethesda, Md. Alex Liang • Freestyle/Butterfly/IM • 6-1 • Palo Alto, Calif.
Brennan Pastorek • Breast/IM • 6-3 • Savannah, Ga.
Stanford unofficially kicked off the 2017-18 season with its annual alumni meet on Oct. 13. The Cardinal officially starts the season on Friday when it travels to Utah for a coed dual meet, followed by a trip to Stockton, California, for the UOP Invite on Oct. 27-28. Stanford then travels to Berkeley, California, for its annual triple-distance meet with Cal on Nov. 8 before wrapping up the fall season at the Texas Invitation in Austin, Texas. The Cardinal starts 2018 by hosting Pacific on Jan. 12, followed by Pac-12 coed dual meets against Arizona and Arizona State on Jan. 19-20. Stanford heads south to face USC on Feb. 3 before closing the regular season at home against Cal on Feb. 17. The Pac-12 Championships will take place Feb. 28-March 3 in Federal Way, Washington, and the NCAA Championships will be held March 21-14 in Minneapolis. Five Cardinal – Matt Anderson, Abrahm DeVine, Sam Perry, Grant Shoults and True Sweetser – will represent the Pac-12 in the second edition of the USA College Challenge on Oct. 21-22 at the Uytengsu Aquatics Center in Los Angeles. The event pits the best current Pac-12 swimmers against the USA All-Stars, which includes 11 United States Olympians. The short-course yards meet will be contested in dual format, the Pac-12 Networks will provide live coverage. Full rosters for both men and women, and tickets on sale can be found at usaswimming.org. Stanford returns 12 of 15 All-Americans from last season, led by senior captain Sam Perry, who collected six All-America honors last season. Returning first-team All-Americans include Matt Anderson (400 medley relay, 200 medley relay), Abrahm DeVine (400 IM, 400 free relay), Ryan Dudzinski (400 medley relay, 200 medley relay), Liam Egan (800 free relay), Andrew Liang (400 medley relay, 200 medley relay, 400 free relay), Ted Miclau (platform), Perry (400 medley relay, 200 medley relay, 100 free, 400 free relay) and Grant Shoults (800 free relay, 500 free, 1,650 free). Joining Perry as team captains will be senior Patrick Conaton and junior Matt Anderson. Captains were selected by a vote of their teammates in May – Perry and Anderson are first-year captains, while Conaton returns as team captain for the second season running. 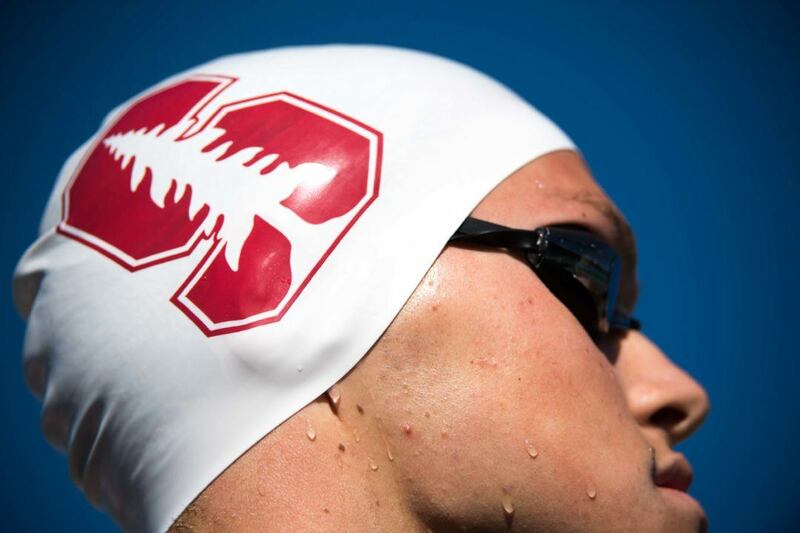 Stanford won its second consecutive Pac-12 Championship last season, led by its distance swimming and excellent diving. Bradley Christensen won the 1-meter for the second straight season, and Tarek Abdelghany secured his first conference title on the platform. In all, Stanford earned six top-four finishes en route to scoring more diving points than any other school. True Sweetser led a one-two-three finish in the 1,650-yard freestyle, followed by Grant Shoults and Liam Egan. Shoults also claimed the 500-yard freestyle in record-setting fashion, Sam Perry earned a pair of runner-up finishes in the sprint freestyle events and Abrahm DeVine bagged top-three finishes in both individual medley events. In the end, Stanford’s 784 point total was enough to fend of Cal (757) and USC (657) for the Cardinal’s 64th conference title in program history. Three Cardinal qualified for the World Championships this past summer – Abrahm DeVine, Sam Perry and True Sweetser. DeVine, swimming in a loaded 200 IM field at the United States Trials, qualified with a 1:56.79 time, including a 27.81 freestyle leg, the fastest in the field. DeVine would finish 10th at the World Championships, missing the final by .20 seconds. In the 1,500-meter freestyle, Sweetser completed a tremendous comeback to win at Trials after sitting in eighth place at the 400-meter mark. With 100 meters to go, Sweetser (14:59.73) seized the lead and never looked back, punching the Americans’ only ticket to the World Championship in the event. Sweetser eventually finished 16th at Worlds, swimming 15:07.38 in preliminaries. Sam Perry, representing New Zealand, qualified for the World Championships in the 50-meter freestyle, 100-meter freestyle, 400-meter freestyle relay and 100-meter butterfly. Perry, a 12-time All-American, finished 49th in the 50 free, 51st in the 100 free and 14th in the 400 free relay. Stanford once again set the academic standard in men’s college swimming in 2016-17, earning a league-high 18 Pac-12 All-Academic selections and putting 16 swimmers on the CSCAA Academic All-America list, the most of any program in the country.